HOUSTON—(ENEWSPF)–September 8, 2017. A majority of polluted Superfund sites flooded in Texas by Hurricane Harvey are in low-income neighborhoods or communities of color, according to U.S. Census data analyzed by the Center for Biological Diversity. Today’s analysis found that nine of the 16 Superfund sites reported flooded by the U.S. Environmental Protection Agency and the Associated Press are in communities where the majority of residents are people of color, low-income or both. The potential overflow of toxic chemicals from inundated Superfund sites — designated by the federal government as the most hazardous polluted areas in the nation — poses contamination risks to surrounding floodwater, soil and people. Yet EPA response personnel did not visit many flooded sites for days, even though they were accessible. There are 82 Superfund sites in the coastal counties in Texas affected by Harvey, which generated extreme flooding driven partly by climate change. According to the Center’s analysis, 60 of these polluted sites — or 73 percent — are located in communities that are predominately low-income or people of color. Harris County alone has 50 Superfund sites, the most of any county in Texas. Neighborhoods with Superfund sites in this county are on average 79 percent people of color and 42 percent low-income residents. The potential release of Superfund contaminants like perchloroethylene and chlorinated hydrocarbons poses long-term health risks for residents, many of whom have just lost loved ones, homes and pets because of the storm. 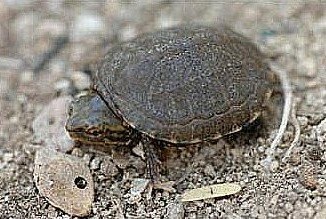 The badly flooded Highlands Acid Pit in the Houston area, for example, was used by the petroleum industry as a dump site for toxic sludge and sulfuric acid. The Harvey crisis comes at a time of turmoil for the EPA, which has lost 400 employees since Aug. 31. The Trump administration has pushed for deep cuts at the agency, which is now headed by Scott Pruitt, a close ally of the oil industry. 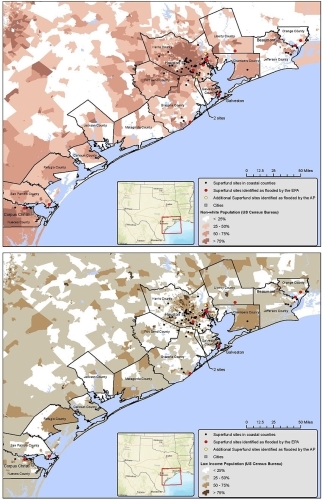 The maps above display the Superfund sites among coastal counties affected by Harvey that reflect sociodemographic data.